A newly elected county judge resigned abruptly. Just one problem: It was an accident. Judge William McLeod declared his run for the Texas Supreme Court. But as he later discovered, doing so invoked a provision in the state's constitution that may force him to leave his post. Judge William McLeod thought he’d had a pretty good first two months on the bench at Harris County Civil Court. So good, he figured he was ready to take a run at the Texas Supreme Court. So he did what aspiring justices do in the state: filed paperwork with the Texas Ethics Commission declaring his intentions and, for good measure, changed the heading on his website to reflect those new ambitions. “I want to make a difference across the State of Texas,” he wrote. But instead of preparing a bid for another, higher office, McLeod is now scrambling to hang on to the one he has — his judgeship, which is threatened by a clause in the state constitution. Shortly after he declared in early March, about 60 days after taking office, a friend and fellow judge warned him that he may have inadvertently invoked Article 16, Section 65, of the constitution, which considers any declaration of candidacy for another office an automatic abdication of an official’s current position. McLeod, realizing his error, removed from his website the references to his Supreme Court run and retracted his announcement, saying he’d rather finish his four-year term as county judge. But the Harris County Attorney’s Office informed McLeod that there was no going back. The law is supposed to discourage officeholders from using their positions as platforms to run for other offices, furthering their careers on the taxpayers’ dime, Soard said. He couldn’t remember another case of an official accidentally running afoul of the provision. 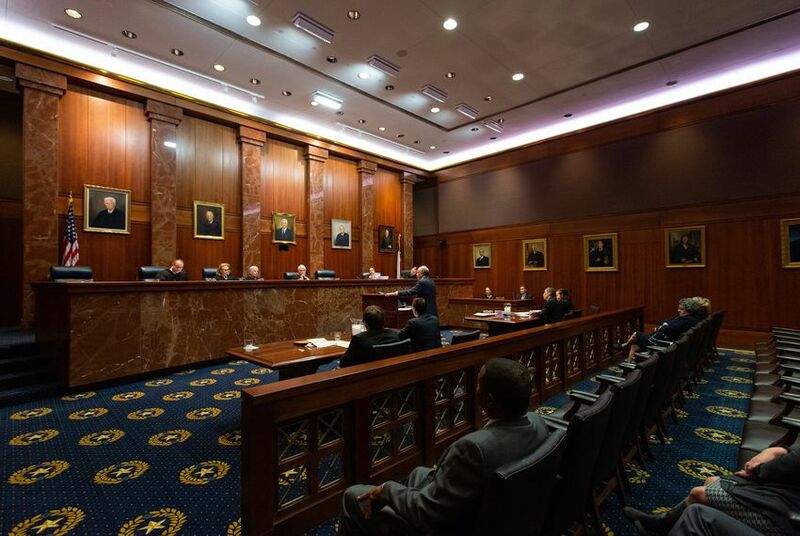 Soard’s office gives legal advice to the Harris County Commissioners Court, the legislative body that will decide whether it will replace McLeod or allow him to stay in office. Under the constitution’s holdover provision, McLeod said, the commission could leave him be. But if he’s able to remain, McLeod may have to run for his seat again in a 2020 special election. The commission will discuss McLeod’s fate at an April 9 meeting. Three of the five members are Democrats, so if the vote breaks along party lines, McLeod — a self-described liberal — should be safe. But McLeod is still nervous — “anything could happen,” he said — and he plans to argue at the meeting that he should be allowed to stay on and run in the 2020 special election. And, he said, he won’t be alone. Some said cutting short his tenure would be usurping the will of the people who elected him. McLeod contends that the commissioner should regard his diverse constituency as an asset no potential replacement could match, a reason he should remain on the bench. McLeod says he understands that argument — he’s a law man himself — but he said he’s making a legal case that he should be allowed to stay. “I’m not asking for anything special; I’m just asking for the whole law to be considered,” he said, referring to the holdover provision. The experience, McLeod said, has humbled him. County judge is the first elected position he has held, and if he can hang on to it beyond next week, he doesn’t plan on running for something else anytime soon — not the Supreme Court, not in the next election, or the one after that.